Mandas Disney Blog: Tangled Inspired Cupcakes! 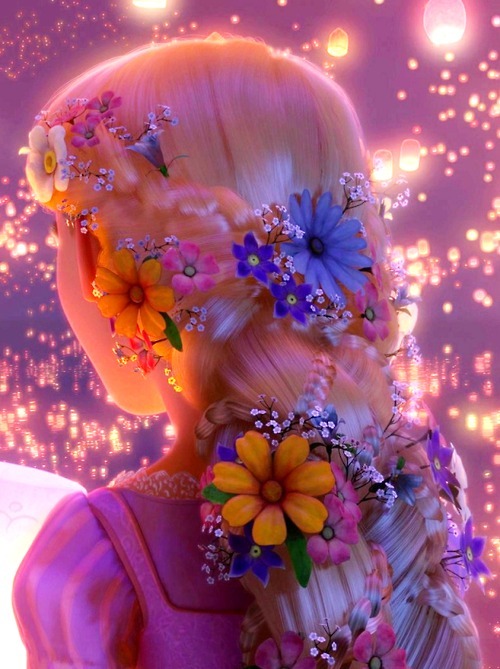 I found this gooorgeous pic of Rapunzels hair when it's in braids with pretty flowers in it :) and thought I could make cupcakes iced yellow with pretty flower designs on them! These were super super easy to make, I just had to find the right decorations! I used ready made chocolate chip cupcakes (shh!) because I didn't have a lot of time that day! But they were Bakin' Boys so it's cool :P For the yellow icing I used Betty Crocker vanilla icing ( this stuff is amaaaazing! lol! ) and added some yellow food colouring. You could use any kind of flowery decorations you can find though :) Or even just draw on your own using coloured icing tubes! Tah Dah! Some cute Tanlged inspired cupcakes! This post is part of the 23rd Disney Blog Carnival! My daughter says, "WOW!" I agree! These are so cute! You can also buy edible flowers by Wilton. They sell here at all the craft and department stores. Love these!! They would be great for a Tangled Tea party! So so cute!!!!!! I want one! I love these! I've seen quite a few Tangled inspired sweets but this is the first time I've seen one inspired by her hair when it was braided with beautiful flowers. Such a great idea! Thank you Beth! Also I googled Wilton Edible flowers - My mind is blown! So cool! Thank you Disney on Wheels! This the 1st chance I have had to check out the blog. Those cupcakes look amazing! I also saw the apples, you must be a pro! Absolutely stunning! You are such a talented baker! Great job, Manda!